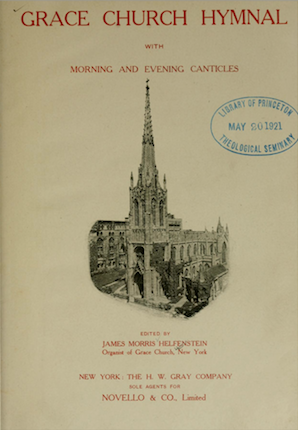 During the year 1909 a new Grace Church Hymnal with Morning and Evening Canticles was published, edited by James Morris Helfenstein. This was the year of Dr. Huntington’s death, and the volume is inscribed: “Before this compilation could be finished the writer of the following Preface had entered into his rest. But for his encouragement and sympathetic interest this arduous task would never have been undertaken, and in grateful remembrance of many years of appreciated service the editor dedicates his work to the memory of the Reverend William Reed Huntington”…..from: Grace Church in Old New York. ….see below for a few more quotes from this text by William Rhinelander Stewart, 1924. Click the links below to see the 1909 Grace Church Hymnal, beautifully preserved by the Princeton Theological Seminary.